Concrete walls can be intimidating to some people who wish to hang large, heavy items like microwaves. Microwaves require plenty of support to remain in place, and concrete walls can provide that support if you know the right approach. Hanging a microwave on a concrete wall consists of two main steps. Choosing the right anchor system is the first, and knowing the proper method for suspended microwave installation is the other. Use your tape measure to check that your mounting area is tall enough and wide enough to accommodate your particular model microwave oven. Use your tape measure to check that the cabinet located just above the mounting area is deep enough to receive the microwave. Check with the manufacturer's recommendations to determine what size space you will require. Use your tape measure to check that the top edge of your mounting space is at least 30 inches above your range top, if applicable. Use your level to check that the underside of your cabinet is level. Use your tape measure to record the height of the overhang at the bottom-front of your cabinet. Use this measurement to determine how far below the rear of the cabinet your mounting plate should sit. Use your tape measure, pencil and straight edge to draw your top edge guide line. Use your tape measure to record the width of the mounting area. Find the center point of your measurement and use your plumb line, straight edge and pencil to mark it from top to bottom. Remove the microwave mounting plate from the rear of your microwave and align it on the wall at the center line. Use your pencil to mark each of the mounting plate screw holes on your concrete wall. Remove the mounting plate from the wall. Use your drill and 3/8 inch masonry bit to make pilot holes at each of your marks. Insert a 3/8 inch one-piece expansion anchor into each pilot hole. Use your hammer to drive the anchors into the wall so that they are flush with its surface. Hold the mounting plate up to the wall so the screw holes align with your mounted anchors. Install your anchor bolts and washers, and tighten in place using your wrench. Hold your cabinet bottom mounting bracket in position beneath the top cabinet. Mark each screw hole and the electrical cord hole on the surface of the cabinet bottom with your pencil. Remove the bracket. Use your drill and wood bit to make pilot holes at each marking. Use your drill and hole cutter to make the hole for your electrical cord. Set the bottom rear of the microwave into the wall mounting plate and tilt the microwave upward and into position. Slide the electrical chord through the hole in the top cabinet you have cut for it. Open the cabinet doors and insert a self-aligning screw (provided by the manufacturer) into the center screw hole. Turn the screw two times in a clockwise direction by hand. The microwave will now remain suspended in place while you install the remaining mounting screws from inside of the cabinet. Use your screwdriver to tighten all the screws in place. 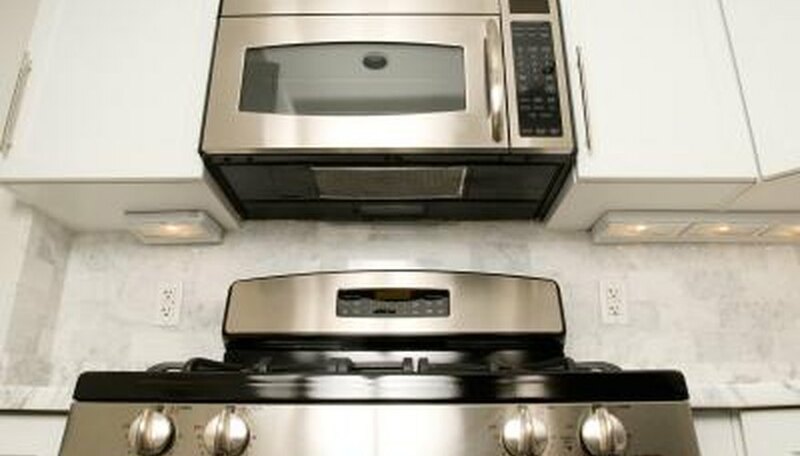 If your top cabinet does not have a front overhang, install your microwave flush with the bottom of the cabinet. Wear eye protection when working with hammers and drills.